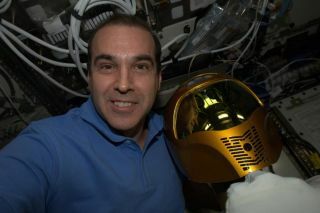 NASA astronaut Rick Mastracchio posted this selfie snapshot of himself and NASA's Robonaut 2 robot on the International Space Station while taking part in the "Live From Space" broadcast on the National Geographic Channel on March 14, 2014. For two hours Friday, astronauts in orbit opened their out-of-this-world home to the people of Earth, offering an unprecedented raw glimpse into the beauty – and peril — of life on the International Space Station. In the National Geographic Channel's TV event "Live From Space," American astronaut Rick Mastracchio of NASA, Japanese astronaut Koichi Wakata and Russian cosmonaut Mikhail Tyurin gave viewers a tour of their orbiting outpost and dished on everything from space toilets and experiments to dangerous spacewalks and space junk. Hosted by veteran anchor Soledad O'Brien and co-anchored by NASA astronaut Mike Massimino, "Live From Space" tracked the space station as it sailed over Earth at 17,500 mph (28,163 km/h), completing just over one complete trip around the planet during the two-hour show. O'Brien and Massimino reported live from NASA's Mission Control Center at the Johnson Space Center in Houston, with several other astronauts making cameos to discuss various aspects of life in space. "Everything that we can see from here — from the space station — on the ground's surface, it's not a movie or virtual reality," Tyurin told O'Brien during the program. "It's a real reality and since the borders aren't visible maybe it means that we don't have them at all." The station crew discussed the dangers of space junk (they have to take shelter in lifeboat-like Russian Soyuz capsules if debris gets too close), while a pre-recorded segment touched on the dangers of spacewalks, including a near-drowning of Italian astronaut Luca Parmitano when water leaked into his spacesuit helmet last summer. The astronauts also touched on some of the more mundane aspects of life in space during the program. Wakata and Mastracchio also walked the audience through some of the odd differences between life in orbit and on Earth. From going to the bathroom to getting a haircut, everything is more complicated on the space station. "It is a small toilet, and actually, part of it breaks down every once in a while and we get to work on the repair work here," Wakata said while showing off the space potty. Astronauts need to use a special vacuum attached to a pair of hair clippers to be sure the hair particles don't fly all over the station. Wakata, Tyurin and Mastracchio have lived on the International Space Station since November. They recently said goodbye to three crewmates — NASA astronaut Mike Hopkins and cosmonauts Oleg Kotov and Sergey Ryazanskiy — who returned to Earth on Monday (March 10). O'Brien arranged a reunion of sorts Friday night, with Hopkins joining here in Mission Control to talk to his former crewmates. NASA astronaut Mike Hopkins (left) at NASA's Mission Control in Houston chats with fellow NASA astronaut Rick Mastracchio (right in blue shirt) and Japanese astronaut Koichi Wakata while the two men were still floating in weightlessness on the International Space Station. Hopkins returned to Earth on March 10, 2014, but spoke here with the station crew on during the National Geographic Channel's "Live From Space" event on March 14. Wakata said jokingly that he wanted Hopkins back on board, if only so that the American could clean up the trash he left behind. Hopkins said he'd love to take on more trash duty if it meant a trip back into space. But while some things are hard in space, it doesn't mean that the astronauts won't miss it when they leave. "Once you leave here, you're really going to miss this place," Mastracchio said. "I've been up here for four months. I've been away from home for almost six months. I know I'm going to miss the great views out the window and I'm definitely going to miss sleeping in a zero-g environment. It's absolutely fantastic. When this mission is over, I'm definitely going to be happy to go home and see my family." "I really enjoy watching my home country through the windows of the space station," Wakata said during the program as the space station was passing over his home country of Japan. Wakata is the first Japanese commander of the space station. Having a robust human spaceflight program can also help humanity move forward, Wakata said during the program. "We cannot see boundaries on Earth," Wakata said. "I think expanding our human frontier into space by exploring is part of our DNA. I think the human space program is a vehicle for the survival of the human species. In the future, at some time, we will need to have a home away from home in order to survive a potential environmental impact from an asteroid or an eventual loss of our sun in 5 billion years. I believe that our survival as a human species is the ultimate purpose of human space exploration."